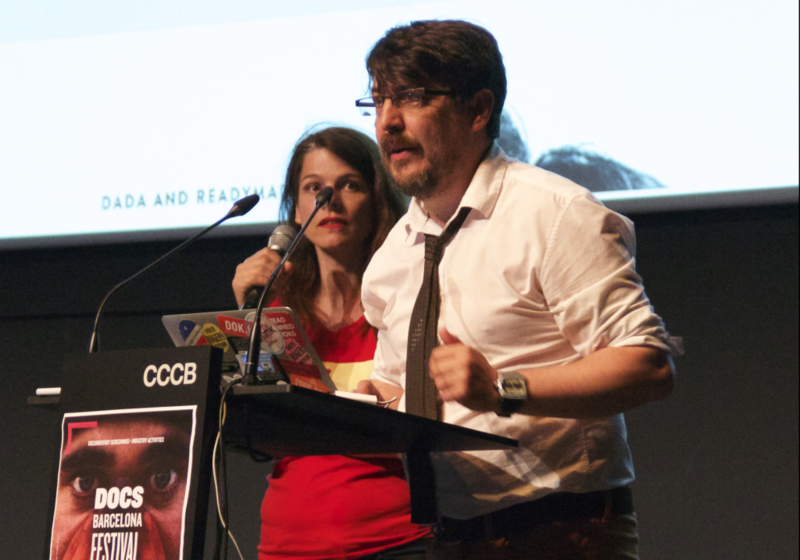 InterDocsBarcelona 2016 was filled with news from the interactive storytelling world. All different kinds of makers and audiences came together at the Centre de Cultura Contemporània de Barcelona to hear about the newest and the prize-winning projects of the industry. Data usage and its many implications, together with the refugee crisis, were recurrent subjects in the presentations made by producers, directors and also sponsors such as Europa Creativa Media. Our morning started with a presentation by two of the developers of Paraules de Barcelona by Anna Giralt Gris, Rubén Idrobo, Juan Lesta, Jorge Mireles, Valentina Moreno, Ariadna Rodríguez Masià, Mario Trigo and Berto Yañez, which won the award for the Best Prototype from Webdocs Popathon interDocsBarcelona 2015. 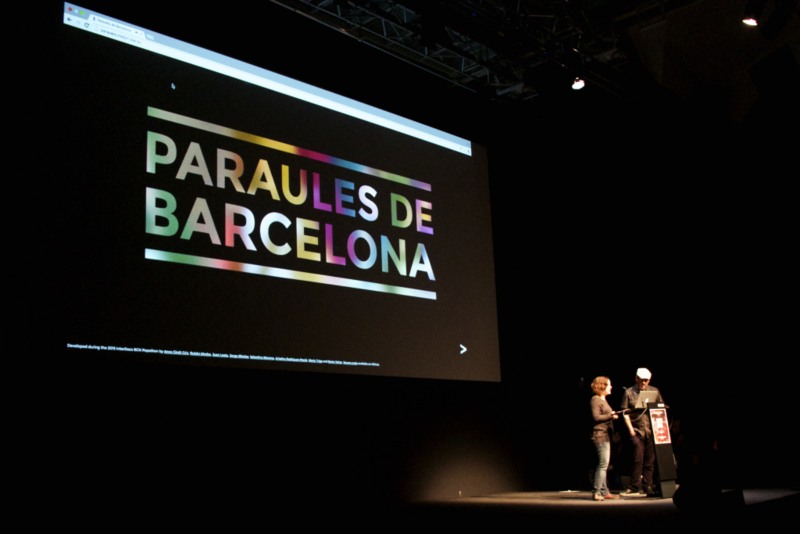 Paraules de Barcelona was conceived in InterDocs Barcelona’s Popathon 2015 and celebrates the environment of the city with an interactive collage made with real photos of the Catalan metropolis. The first keynote speaker of the day, Liz Rosenthal, left us with very important thoughts and ideas on the relevance of a user-centered approach in the development of interactive storytelling. During her presentation, the founder and CEO of Power to the Pixel mentioned a number of projects that exemplify user-centered development of interactive documentaries, which ultimately enables a higher level of engagement with the consumer. The speaker elegantly summarized the user-centered approach by reminding us of the importance of the “3 Ps”: Prototyping, Participation and Personalization. One of the examples mentioned in Rosenthal’s presentation was The Enemy, created by photojournalist Karim Ben Khelifa, and co-produced with Camera Lucida, Francetv Nouvelles Écritures, and Emissive et Department. This project is a gamification of journalistic interviews in which combatants of opposite sides of the same war or civil conflicts talk about their experiences. The user can engage in this experience by using VR glasses, so they become immersed in a 3D world in which they see two 3D characters that represent the combatants. One of the scientific outcomes of the project is the use of neuroscience metrics to determine how much empathy has been generated. She also discussed The Sandy Storyline, which is a participatory documentary that gathers and shares stories about the impact of Hurricane Sandy. The Wilderness Downtown, an interactive film by Chris Milk made with the band Arcade Fire, was also mentioned, due to its interesting feature in which the user types the the address of the home in which they grew up and then they can see the personalized outcome of the house. Last but not least, we listened to Rosenthal’s thoughts on the webdoc Do not Track by Brett Gaylor, a personalized interactive series about Internet privacy and web economy with seven episodes that were first aired in September of 2015. Next the prize-winning keynote speakers David Dufresne, known for works such as Fort McMoney and Prison Valley, and Anita Hugi, head of a program of arts and culture documentaries at SRF (Switzerland), enlightened us with their brand new project called Dada data, which celebrates 100 years of Dadaism. Aspects of this groundbreaking Art School are brought to life on a daily-basis thanks to this digital documentary that consists in interactive exercises, six DADA Hacktions, and a web anti-museum, the DADA-Dépôt. The form of this work is itself a revolutionary act that is somehow in sync with the Dada perspective of the world’s culture and economy. Dadadata’s creator Anita Hugi explains that, while making a linear documentary about Dadaism, she thought about how much Dada was “a little internet before its time” and how much the Internet itself is Dada as well. The enriching presentation ended with David Dufresne presenting his manifesto on interactive works. This manifesto summed up a few of the most valuable considerations that a director of his caliber could give, such as focusing on your first intention throughout the production of the documentary and enforcing complexity instead of complication in your interactive works. The makers of Music Without Boundaries also stopped by to show off their brand new musical documentary that works as a series of episodes in which a number of musicians make their own interpretation of a classic song. There are many broadcasting possibilities for this piece – such as micro-spaces, apps or advertising – which makes it very up-to-date with our user-centered focus so talked about in the conference. 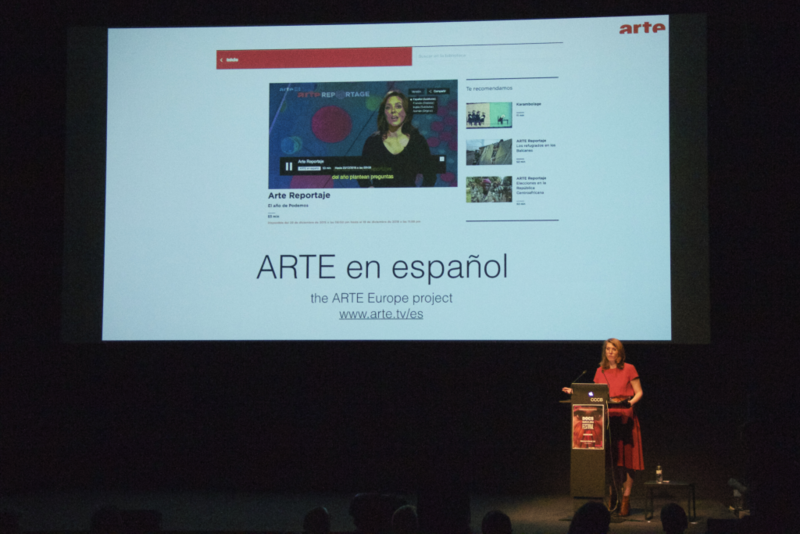 The keynote speaker Emilie Bessard from the broadcaster A r t e gave us a talk on targeted audiences and user-centered development, explaining that we must understand that our audience is not the same audience as for TV and therefore we must adapt to its practices. Distribution and content personalization were also discussed and the interactive web series Do Not Track was once again mentioned in the InterDocs Barcelona Conference as a neat example of user-centered development and personalization. At the end of the morning we had the pleasure of hosting filmmaker Brenda Longfellow and creative technologist Mike Robbins who spoke about Offshore, a full-length interactive documentary about the economy and our toxic dependency on the oil industry. 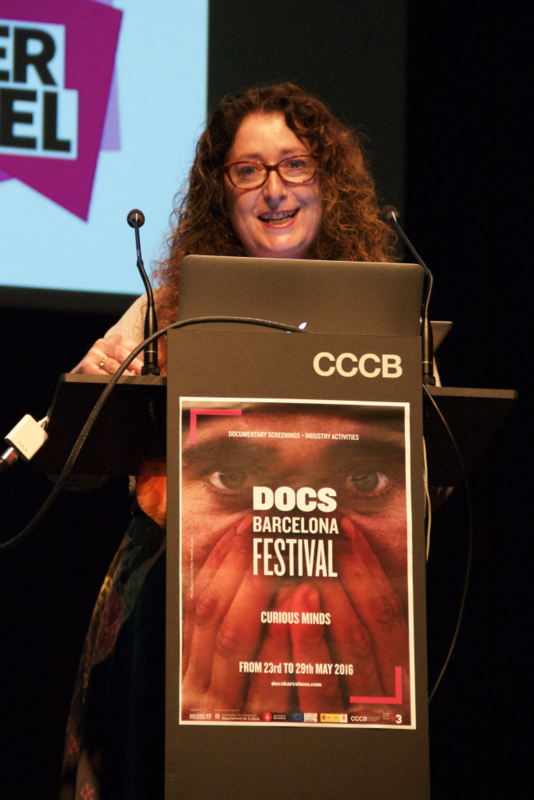 In her presentation, Brenda tells us that as a filmmaker who came from the area of linear environmental documentary, she feels that linear docs seem too stale to address one of the most complicated questions of the 21st century. Mike Robbins talked about the design aspects of the interactive documentary and how they got through the development process working on improvements based on user feedback. At the beginning of the afternoon, we had the pleasure of listening to professor, webjournalist, transmedia producer and member of the DCM Team from Universidad de Rosario, Fernando Irigaray, who briefly presented his extensive work, explaining that he focuses his productions on so-called social narratives because of his geographic and therefore historical conditions. Irigaray also mentioned the importance of social media and user-feedback and how the transmedia and interactive storytelling production pipeline differs from that of linear films. Speakers Angelo Attanasio and Carlos Ruiz presented the project Beyond the Paradise, which investigates the relationships in countries through the tourism industry. The interface uses Thailand, Zanzibar and the Dominican Republic as the themes of this mobile application that praises a user-centered methodology, building up a newsgame that focuses on developing interactions with the user and not just for the user. The afternoon went on with a presentation by Fernan Clavell, who spoke about the expectations of TV3 concerning interactive documentaries and the exploitation and development of 3D landscapes and spaces. Following this, the case study Seguir con Vida from Médico Sin Fronteras, an interesting 360 video experience, was presented by speakers Amaia Esparza and Joan Guasch, who explained more about the development process. Guasch, along with Bernat Aragonés from Antaviana Films closed our afternoon talking about the juicy news of 360 video and Virtual Reality, giving an overview of devices, post-production software and the production routines of this powerful filmmaking gear. After the presentations, attendants gathered for networking on the CCCB ground floor, immersed in the new projects, surrounded by industry colleagues, with a full VR glasses live experience and, of course, with great expectations for next year’s InterDocs Barcelona.